Amazon just announced their latest version of Kindle this morning. One of them will definitely going to my wish list and be one of my Christmas gift to myself. Here the game of eeny, meeny miny, moe begins! A couple of things I need to stress on Kindle Fire. Wifi support only? No camera? No microphone? 8GB, that’s it? This is like a knock-off version of iPad for $199. No thank you! I am keeping my 64GB iPad 2 which I can use to do the exact same things Kindle Fire can do and more. I watched the short video on Amazon’s Silk, the new browser for cloud content. It looks promising but I still would not buy Kindle Fire until all the winkles are ironed out and getting good reviews from users. So, Kindle Fire is definitely not going onto my wish list. Check out the prices! Don’t let them fool you. These prices are for the “With Special Offers” or you would call them advertisements. I am not sure what kind of ads Amazon allow on the Kindle but I don’t want to take the risk of bad commercial showing up on a Kindle held by my kids. I would be getting ad-free Kindle for sure. Add $30 or $40 depending on the model for those Kindle without sponsors. Amazon claimed to work hard to charge customer less, have they take a look at the prices for a cover? $59.99 for the leather cover with light! The older version of Kindle with the keyboard is still available. I would imagine Amazon lowers the price but they didn’t. Surprise surprise! Kindle with keyboard is a better deal than the new Kindle with 5-way controller. I don’t think I like moving the cursor up/down/left/right for typing. 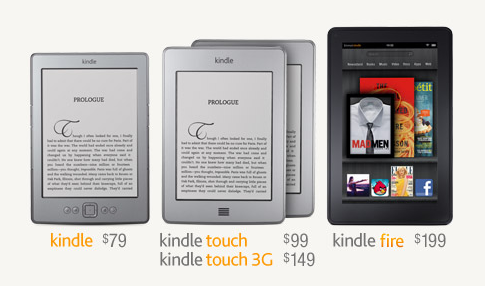 That being said, The new Kindle with 5-way controller is not making its way onto my wish list either. I like this elimination game. Looks like the Kindle Touch is the winner. I still like the Kindle app on my iPhone because I get to read in my bed and in the dark. I do find iPad a bit on the heavy side and reading on iPad outdoor in the direct sunlight sucksI watched the short video on Amazon’s Silk, the new browser for cloud content. It looks promising but I still would not buy Kindle Fire until all the winkles are ironed out and getting good reviews from users. E-ink is a better alternative. Being able to check out books from public library is the biggest selling point for me no matter what.